← Harper and wireless: Is it Lost or Breaking Bad? Okay, so my Consumer Electronics Show gadget showcase was only supposed to be a week-long, but I had to add this extended remix because I saw a really cool gizmo on my last day at the show that I simply had to share. 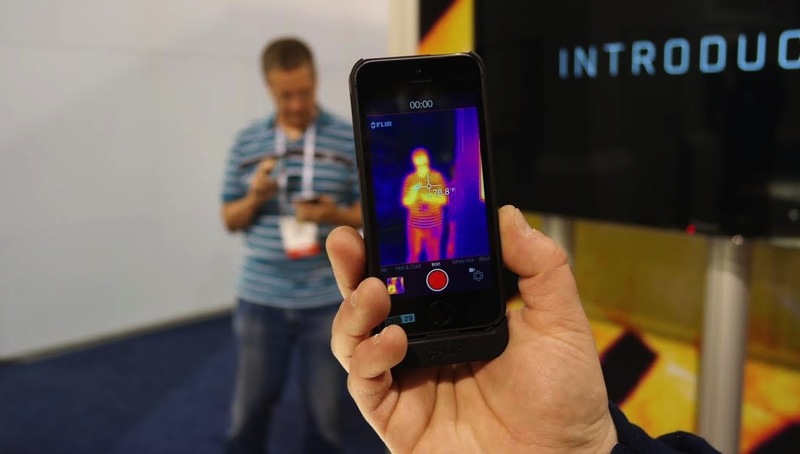 The FLIR One is an attachment for the iPhone (5 and 5S) that adds thermal photo capability to the smartphone. Yes, it gives you Predator vision, or the sort of capability found in many first-person shooter games. It’s obviously got that zip-wow factor going for it, but after getting over the initial coolness, I started wondering about its actual practical applications. The guy at the booth explained that it can be used to find drafts in your home or, in extreme cases, to detect intruders in the night. Since body heat glows brightly on infrared cameras, it’s a great way to see if someone is hiding behind the corner. I’m not so sure about that particular usage. If I suspect someone’s in my house, I probably won’t go walking through it in the dark holding my phone (this is how horror movie plots get started). But the draft-detection is certainly a good angle – I could definitely see that getting some mileage. Still, the technology isn’t cheap. The FLIR One is selling for $350, which is approaching the price of the phone itself. But then again, what price coolness?